Already an established brand in premium collecting, 2017 Leaf Q Multi-Sport promises to be "the industries most comprehensive high-end multi-sport product." To that end, each box includes five autographs or relics, with many from Hall of Fame athletes. 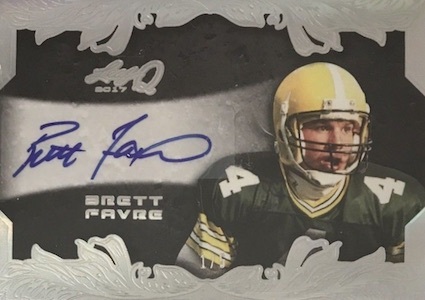 Collectors have likely become familiar with Leaf Q over the years, and while the name quality has increased, the brand stays with it design roots. Featuring only autographs, relics and autographed relics, the 2017 Leaf checklist is diverse and limited. Signed options include Base Auto and Auto Memorabilia cards for top players from many sports. 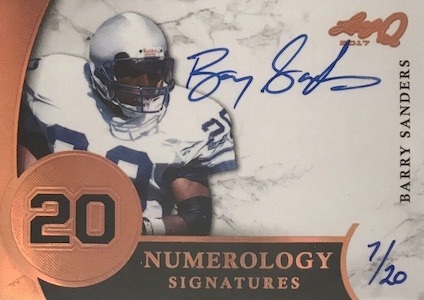 Limited to the player's jersey number, Numerology Signatures pays tribute to the iconic number associated with the subject, as does Numerology Dual Signatures, but with two players who have the same number. Classic Combo Signatures pairs connected legends, while Rivals puts adversaries head-to-head on the same card. 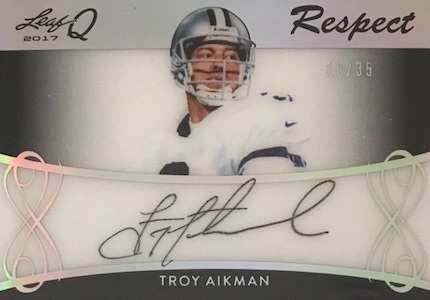 Among the other signed inserts, Respect opts for acetate and Leaf Q Retro relies on prior designs from the brand to celebrate elite athletes. 2017 Leaf Q Multi-Sport also has several memorabilia hits to enjoy. Starting with the jumbo offerings, Patch Perfect features a multitude of superstars using an oversized relic for each. Four Sport Memorabilia keeps to quad relics for the same sport, and Mount Rushmore looks across all athletes to identify four of the very best. Superlative 6 Memorabilia works in the same vein with six all-time greats from the same sport. Pushing that total even higher, The Great 8 showcases eight legendary names from a single sport. SPECTRUM PARALLELS: Blue #/15, Red #/10, Silver #/5, Gold 1/1. SPECTRUM PARALLELS: Blue #/5, Red #/3, Silver #/2, Gold 1/1. 3 cards. Serial numbered #/9. 3 cards. Serial numbered #/50. PARALLEL CARDS: Silver #/25, Gold #/10, Silver Spectrum #/5, Gold Spectrum 1/1. 13 cards. Serial numbered #/50. 1 card. Serial numbered #/85. PARALLEL CARDS: Blue #/25, Green #/10, Red #/5, Purple 1/1. 9 cards. Serial numbered #/9. MR-07 Wayne Gretzky / Michael Jordan / Joe Montana / Ken Griffey Jr. PARALLEL CARDS: Gold Spectrum 1/1. Spectrum Versions: Copper #/12 (No Ryan/Jackson*), Blue (No Ryan/Jackson*), Red #/3, Gold 1/1. SPECTRUM PARALLELS: Red #/4 (Grant Hill, Jason Kidd, Ray Allen - #/5*), Blue #/3, Silver #/2, Gold 1/1. 19 cards. Serial numbered #/9. 12 cards. Serial numbered #/35. SPECTRUM PARALLELS: Platinum #/10, Purple #/5, Green #/3, Gold 1/1. 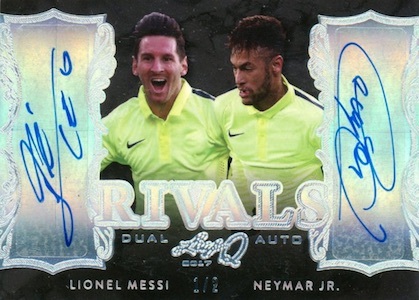 SPECTRUM PARALLEL: Blue #/5 (Ronaldo/Messi - #/4*), Red #/3, Silver #/2, Gold 1/1. 5 cards. Serial numbered #/9. SPECTRUM PARALLELS: Blue #/7 or less, Red #/4 or #/3, Silver #/2, Gold 1/1. No matter where you turn, Leaf seems to get a ton of hate, but please understand they are operating under very limiting conditions, being unlicensed. I have enjoyed seeing them put together some different looking cards that are a departure from the norm. It is quite possible that this year’s Leaf Q may be my favorite yet. Even though they are unlicensed, I like it a lot! Bought one box for $325. It had one of the rarest six-patch cards–Superlative 6 Red Spectrum /4 (Kobe Bryant, Michael Jordan, LeBron James et. al), along with a dual auto Nolan Ryan/Jim Palmer /9. I can’t complain. Just wish someone would make an offer on the red card! I collect hockey exclusively, but I avoid Leaf because I like cards with team logos. I have to say that I love the Nolan Patrick Base Auto that I just got because Upper Deck doesn’t have one. Thanks for the cool design and rare parallels in an awesome Multi-Sport set!